The Eighteenth Judicial District Commission on Judicial Performance unanimously recommends that Judge Darren Louis Vahle BE RETAINED. Judge Vahle was appointed as an Arapahoe County Court judge in the Eighteenth Judicial District in June 2008. 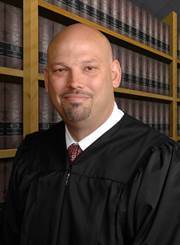 Judge Vahle earned a Bachelor’s Degree from Westmont College in 1991 and his law degree from the University of Denver, College of Law in 1996. Judge Vahle served as a Senior Deputy District Attorney for the Eighteenth Judicial District prior to his appointment to the bench. Judge Vahle speaks to high school students about the court system and the pursuit of academic excellence. He has served as a judge for High School Mock Trial Competitions. He often volunteers to greet jurors at the courthouse. Judge Vahle presides over traffic and misdemeanor cases. In the courtroom he conducts himself in a highly professional manner. He treats all parties with dignity, respect, and kindness. He is efficient and manages his docket well. His knowledge of the law is very good. He maintains a sense of calmness in his courtroom. He listens to all parties, and is fair and consistent when handing out a sentence. The Commission finds that Judge Darren Vahle is a dedicated and fair judge who should be retained on the bench.